HCP’s (NYSE: HCP) senior housing portfolio underwent a transformation in the past two years. The Irvine, California-based health care real estate investment trust (REIT) now is ready to move from playing defense to being in a position to grow the business, despite market headwinds. But there are still some moves HCP needs to do in order to achieve long-term growth in its senior housing arm. The results of HCP’s senior housing restructuring will not yield growth until 2020 at the earliest, Chief Investment Officer Scott Brinker said Wednesday. But the cyclical nature of the senior housing industry and the subsiding of those headwinds has the REIT optimistic about the sector. Brinker delivered his comments at the Citi 2019 Global Property CEO Conference in Hollywood, Florida, where HCP CEO Tom Herzog and CFO Pete Scott also spoke. In order to execute the senior housing portfolio turnaround, HCP needed to have the right people in place. With Brinker and new hire Jeff Miller, a Welltower (NYSE: WELL) veteran who is responsible for senior housing finance and asset management, that team is filled out and ready to act, Herzog said. Brinker acknowledged that the age of HCP’s senior housing portfolio — an average of 22 years — is a concern. HCP believes these properties can perform well, but it will require a lot of capital to modernize the assets. HCP is currently redeveloping 10 properties at a combined cost of $80 million. HCP wants to complement the existing portfolio with newer product, signaling that the REIT will be buyers and builders beyond 2020, Brinker said. HCP sees huge growth and revenue potential in its same store senior housing operating portfolio (SHOP) by switching high-performing assets from triple-net leases to a RIDEA structure, as needed. Although HCP’s SHOP revenue dropped 11.6% in Q4 2018, Brinker attributed this to short-term expenses in its transition portfolio. The company transitioned 38 properties from triple-net to SHOP last year. While the short-term expenses are affecting the later transitions, the properties that underwent the move earlier in the year showed signs of stabilization by the end of 2018, and are now positioned to recapture value over time. And the REIT executives confirmed that HCP is committed to senior housing in the long term, and does not intend to offload this asset class in favor of medical office or life science holdings. 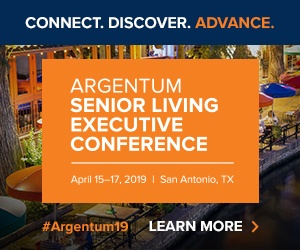 Believing that senior housing has significant long-term upside due to the aging U.S. population, the company is targeting a portfolio where senior housing will account for 40% of its net operating income (NOI).